Recent reports from the U.S., Canada, and Europe detail a disturbing rise in both the number and creepiness of so-called evil clown sightings. 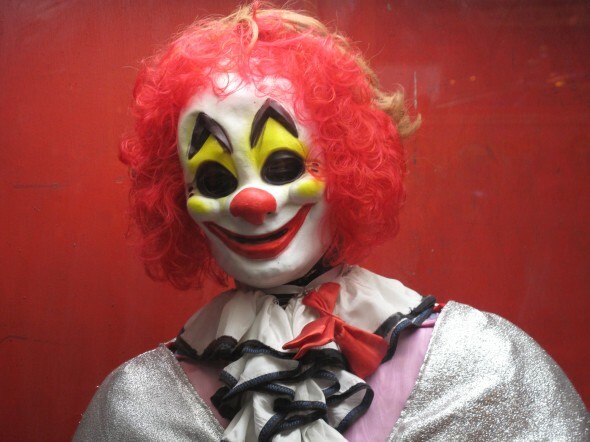 Most reports feature misplaced clowns—many modeled after Pennywise, the clown from Stephen King’s It—posing as part of some bizarre scare tactic or hoax, possibly in the hopes of garnering YouTube views. I argue that understanding this social and psychological phenomenon is at least equally as worthwhile as banning it. To begin, let there be no mistake: evil clowns are disgusting. They are not merely creepy, but unsettling, potentially violent, and frightening to look at. While clowns—as mythologized jokers, tricksters, and pranksters—have been around for nearly as long as history has been recorded, it feels like they have only recently become synonymous with horror. It is this dark side—a penchant, perhaps, for lunacy and maniacal behavior lurking beneath the mounds of makeup and unsightly arched brows—that accompanies the recent sightings. The dark side of clowns inspires terror, according to William Ian Miller, Professor of Law at the University of Michigan Law School. Our emotional reaction to clowns is seldom unaccompanied by disgust. We often use contempt, loathing, horror, and hatred when describing our immediate reaction to creepy-looking clowns. Both the relationship and difference between fear and disgust is explored by Miller in his 1997 book, The Anatomy of Disgust. In it, he argues that the reason for the emotions are so often paired with one another because the two are often intensely co-experienced. Intense disgust, Miller argues, almost always invites fear to attend. This is why experiences of pure, unadulterated fear are easier to remedy than disgust. While fear rapidly decays as it sends us fleeing to safety, disgust seems to linger. It demands purification, a cleansing of both mind and body, according to Miller. Fear, like disgust, is among the most strongly unpleasant emotions one can experience. The uncanny disturbs us in a way that heightens the duration and invasiveness of fear and similar emotions, says Miller. The deformed fragility of evil clowns is nothing if not uncanny.